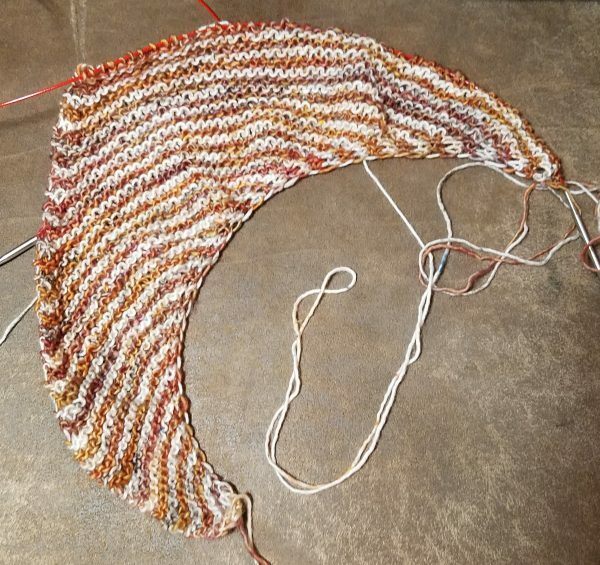 Most of yesterday I worked on the second test knit I’m doing for Ambah O’Brien. You may remember that it’s a three color project. 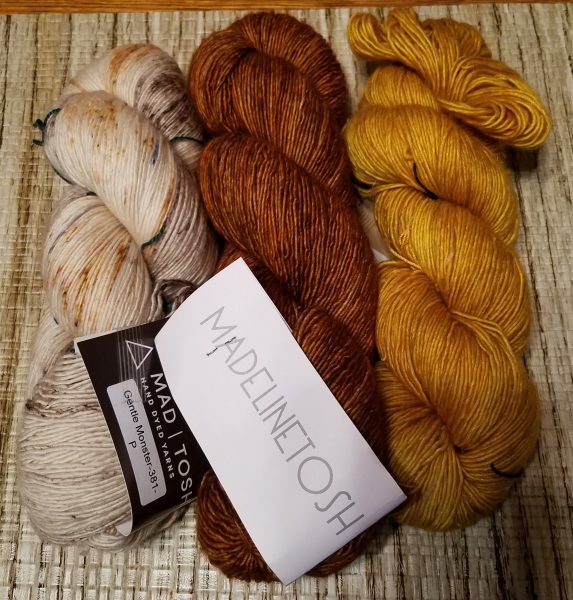 These were the yarns that I finally decided to use before I started knitting. Yesterday I got to the spot where I would use the third color, which would have been gold, and I decided to use something else. The third color is supposed to be a “pop” or “fizz” color and I’ve been able to see what others are using and the brighter, less “blendy” colors are looking so much better to me. This is where I will pick up the third color. Any guesses as to what my “pop” color is going to be? What would you use if you wanted something to stand out but not be too wild and crazy? I’d use a deep royal purple with what you’ve already got. Purple was my first thought also. Oh my goodness, being a 70 year old Woodstock attendee my first thought was purple. I would like matching socks also. Cilla in snowy NH. I’m with the purple crowd! A rich, jewel color of purple. Ooh! Well, I was going to say purple. Green came to my mind! My I looked at the one yarn and thought I saw teal in it, so I thought teal would be pretty. It does already have gold in it. I have no idea what else it would look good with, but I’m going with emerald green.